Born in Royal Palm Beach in Florida on May 2, 1985, Jarrod Saltalamacchia immersed himself in baseball from a very young age. By the time he reached high school, Jarrod had set himself apart with a unique skill set as a switch-hitting catcher and with his talent. He participated in numerous Perfect Game and TeamOne showcases and tournaments throughout the country and was a member of Team Florida USA, which won the 2001 USA Junior Olympic Baseball Championships Gold Medal. In the 2003 draft, Jarrod was selected out of Royal Palm Beach High School by the Atlanta Braves in the first round, the 36th overall pick. Jarrod rose quickly through the minor leagues. In 2003 he helped the Gulf Coast Braves win the Gulf Coast League Championship for the first time in the club’s history. Jarrod soon became one of the organization’s most popular prospects through his dedication to the game and his generosity in interactions with fans, both of which he maintains in his approach today. In 2006, Jarrod had a breakout season for the Class-A Myrtle Beach Pelicans and was named the #1 prospect in the Atlanta Braves organization by Baseball America. After being promoted to starting catcher for the Double-A Mississippi Braves to begin the 2007 season, Jarrod was called up to the major leagues on May 2, 2007, his 22nd birthday. Jarrod’s call-up made him the new record-holder of the longest surname in Major League Baseball history at 14 letters. But Jarrod was making an impact with more than just his name. He had the first hit of his major league career on May 6, 2007, in the sixth inning of a game against the Los Angeles Dodgers. In the seventh inning, with two outs and two men on base, Jarrod hit his first RBI, which also drove in the winning run for the Braves. On May 27, 2007, Jarrod hit his first major league home run, a solo shot off of pitcher Cole Hamels of the Philadelphia Phillies. Jarrod was traded to the Texas Rangers on July 31, 2007. While with the Rangers Jarrod split his time between the major league club and the Rangers’ Triple-A affiliate, the Oklahoma City Redhawks, battling injuries and roster moves as the club struggled through a rebuilding process. 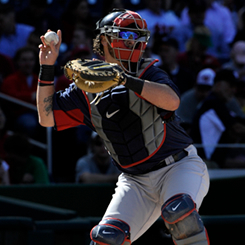 Jarrod continued to develop his catching and hitting skills and found ways to make his presence felt. On August 22, 2007, Jarrod hit two home runs and collected seven RBIs in the historic 30–3 rout of the Baltimore Orioles. The 30 runs were the most in the Major Leagues since the 19th century and set a new American League record. Though Jarrod played only one game with the Texas Rangers in 2010, he made it count. On April 5, Opening Day, Jarrod hit a walkoff single in the bottom of the 9th inning, bringing the Rangers to a 5-4 comeback win over the Toronto Blue Jays and starting the Rangers on their historic 2010 championship run. It was the first walk-off win in a home opener for the Rangers since 1980. On July 31, 2010, Jarrod was traded to the Boston Red Sox organization. After reporting to the Triple-A Pawtucket Red Sox, Jarrod was called up on August 11, 2010, and has since been designated as starting catcher for the Boston Red Sox. During his tenure with the Red Sox Jarrod has built his reputation as an elite power-hitting catcher, hitting a career-high 25 home runs in 2012, one shy of the record set for home runs in a season by a Red Sox catcher. On May 21, 2012, Jarrod hit the longest home run by any Red Sox player in five years, measured at 466 feet. He hit his first walkoff home run on May 26, 2012. Being a member of the Red Sox also gave Jarrod the opportunity to make huge defensive strides as he worked with such legendary players and coaches as Jason Varitek, Tim Wakefield, and Gary Tuck. His dedication, integrity and approachability have earned him the reputation as one of the most respected players in the game, and on January 19, 2012, Jarrod was honored by the Boston chapter of the Baseball Writers Association of America at their 73rd annual Boston Baseball Writers dinner with the Good Guy Award. On September 25, 2012, Jarrod was named BoSox Man of the Year by the BoSox Club, an award given to a Red Sox player that recognizes not only the player’s contribution to the success of the team on the field, but also for his cooperation and efforts in community endeavors. Jarrod became a World Series Champion with the Boston Red Sox in 2013. 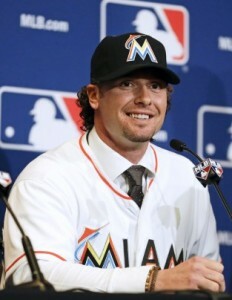 On December 9, 2013, Jarrod signed a 3-year, $21 million dollar deal with the Miami Marlins. After the signing, he thanked the fans of Boston through a personal letter. As his career has progressed, so has Jarrod’s dedication to making contributions in the community. Jarrod was named Jimmy Fund Co-Captain in 2012 to support and promote the mission of the Dana-Farber Cancer Institute and the Jimmy Fund to strike out cancer. Jarrod also became a spokesperson for HomeStart, a leading non-profit organization dedicated to ending and preventing homelessness in the greater Boston area. Through a campaign with iParty stores in 2012, Jarrod helped raise nearly $50,000 for the Boston Medical Center’s Grow Clinic. Jarrod also leant his name to an espresso drink made by Boston Common Coffee Company, the “Saltalamocchia,” sales of which also benefit the Grow Clinic. In his free time, of which there isn’t much – Jarrod enjoys spending time with his beautiful wife Ashley and 3 beautiful daughter Sidney, Hunter and Sloane. He also enjoys hunting, horseback riding and fantasy football as well. Thanks to Elspeth Reed for her contributions to this section. © 2014 Jarrod Saltalamacchia. All Rights Reserved.